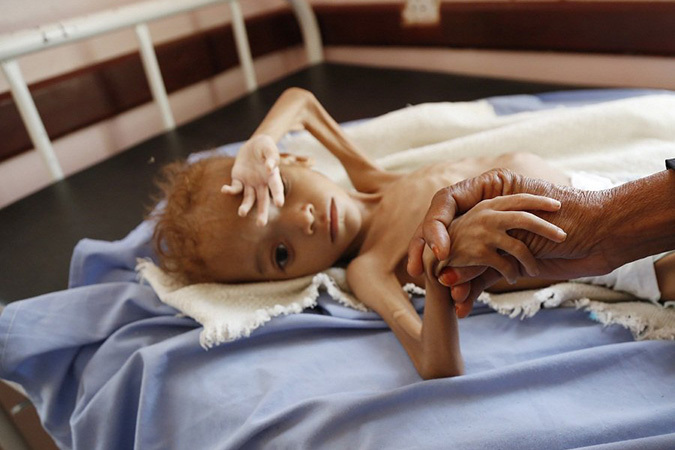 Penelitian - Yemen is currently facing the world's worst hunger crisis, with some 8 million people considered to be on the brink of famine, a World Food Programme (WFP) official told journalists on Tuesday. Herve Verhoosel, spokesperson for the WFP, told the press briefing that if the situation persisted, there could be an additional 3.5 million people in need of regular food assistance. "Some 570,000 people had fled Hudaydah since June, the currency had plummeted and the cost of food had risen by a third in one year," Verhoosel said. Since 2017, he said, WFP had increased its assistance to Yemen by 25 percent despite a difficult security situation, limited access and frequent attacks, to distribute food aid to 8 million inhabitants a month. According to him, several boats are on their way to the various now functioning ports, but access to the 51,000 tons of grain stored in silos on the Red Sea, which could help a further 3.7 million people for a month, remained blocked. Replying to questions from journalists, Verhoosel said that the current situation was not the result of any one single issue but, rather, of an accumulation of economic, security and monetary problems. "While WFP was carrying out tremendous work given the conditions on the ground, some areas remained inaccessible and not all children in need could receive long-term support, so some were dying on a daily basis," Verhoosel said.